Bryon Ehrhart's Reichel/Pugh 63 Lucky has been confirmed as the winner of the Transatlantic Race 2015 by the event's four organizers: the Royal Yacht Squadron, the New York Yacht Club, the Royal Ocean Racing Club and the Storm Trysail Club. 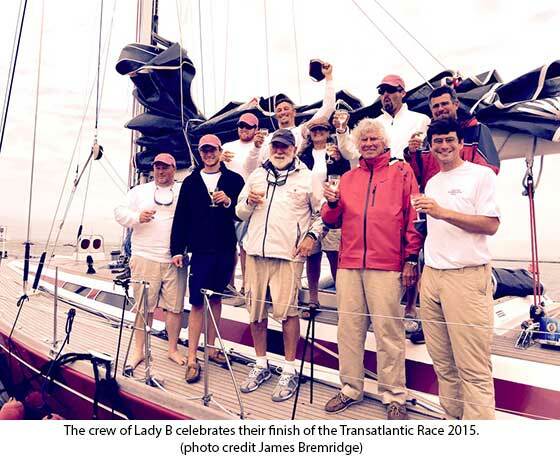 This almost closes the latest chapter in what is the world's oldest trans-oceanic yacht race. In 1866, just 15 years after they famously won off the British what would become the America's Cup, the New York Yacht Club ran its first Transatlantic Race. Since then it has been held irregularly, the most famous occasion being in 1905 when it was of political consequence in the build up to the First World War. Intended by Kaiser Wilhelm II as a means of illustrating German supremacy at sea at a time when ‘Britannia ruled the waves', he presented the solid gold ‘Kaiser's Cup' as the trophy for which the 1905 event would be raced. Ultimately the Kaiser's yacht Hamburg was roundly dispatched by American Wilson Marshall's Atlantic with Charlie Barr, the Russell Coutts of his day, driving the 227' three-masted schooner from New York to The Lizard in just 12 days, 4 hours, 1 minute and 19 seconds. The Transatlantic Race 2015 has once again proven that America rules the waves, with Chicagoan Bryon Ehrhart's Lucky claiming the overall victory under IRC along with a Rolex timepiece. Jim Clark and Kristy Hinze-Clark's 100' maxi Comanche recorded the fastest monohull crossing in 7 days 11 hours and 35 minutes (outside of the course record of 6 days 22 hours 8 minutes and 2 seconds set by George David's Rambler 100 in 2011), and Lloyd Thornburg's MOD70 trimaran Phaedo³ the fastest multihull in a time of 7 days 2 hours and 4 minutes. 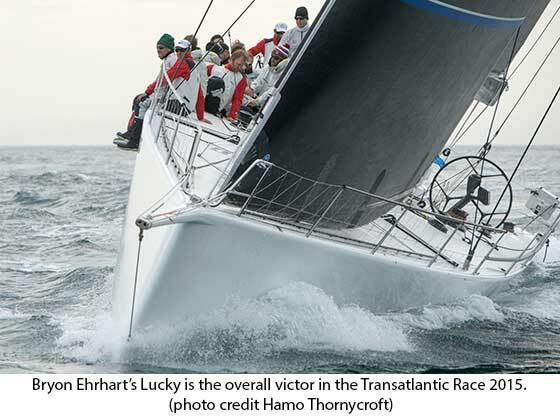 "We are thrilled to have achieved the result in our tenth year of campaigning various versions of Lucky in offshore events," said Ehrhart. "We have competed in substantially all of the global ocean racing classics; the Transatlantic Race was properly held in our program as the classic of all the classics. We were humbled just to be allowed to compete in the longest standing and most respected ocean race. "I remain in awe of the crew that prepared us so well over the last 10 years and led us to the opportunity to compete in the Transatlantic Race 2015. To win the event is well beyond our expectations given the long list of competitors we have come to respect. The win is a testament to the strength of the commitment we have made to the program and to each other." Winning the unofficial doublehanded sub-division of the Class 40 was Michael Hennessy's Owen Clarke-designed Dragon, which arrived in 11 days 20 hours and 12 minutes, 1 day and 13 hours after the Class 40 winner Stella Nova. While the German boat was being sailed by a crew of four, Dragon, along with the other two American Class 40s competing, was racing doublehanded. "That dictated a lot of our choices," said Hennessy, who made the crossing with Kyle Hubley. "They [Stella Nova] made the choice to get north in front of the low, so that it would catch up to them, and then ride out the heaviest wind there. Whereas I just felt that would break us and the boat and going doublehanded with a cockpit that has very little protection. I think that Amhas' experience demonstrated that." Amhas was the only Class 40 to retire from the race. As a result Dragon was ‘only' subject to winds in 30-knot range that briefly built to the 40s in squalls. "It was really the sea state that made it difficult, it was pretty wild in certain places," said Hennessy. Otherwise Hennessy felt the trip went well: "It was fantastic. We had a fast passage and nothing broke and I feel like we made the right choices with rig settings. If it wasn't for Stella Nova putting together the performance of a lifetime we would be really proud of ourselves..."
And overall, their passage between Newport, R.I., and The Lizard was fast, in fact much faster than Hennessy's expectations: "Before the race I was telling some folks that I was taking food for 18 days, expecting 14 days and on the best possible conditions 12 days. And we beat my best estimate!" Jack Madden's Swan 60 Lady B was the only boat to arrive in Cowes today, claiming second place in the Cruising Class, behind Earl St. Aldwyn's Shipman 50 Zephyr. This was Madden and his crew's first Transatlantic Race, although he and his crew, who are all from the New York/New England area, have been racing together for many years and have previously competed in the Newport Bermuda Race. "It went wonderfully, we had a great time, it was a lot of fun," said Madden. "The crew worked out very well. We didn't have any major problems whatsoever, only a few minor things, so we are very pleased with that. We were surprised by the intensity of the wind from day two until about day seven or eight. We were also surprised by the lack of sun. We thought there might be sun on the way to the U.K., but we had a grey umbrella with us all the way! But all in all it was great; we had a wonderful time." Lady B has a well-appointed interior, with cabins and comfortable beds, and they also had a cook on board to prepare hot meals. "The comaraderie of the crew was great and fun and the entertainment we had teasing each other was wonderful. So the whole experience was a 10," concluded Madden.